The evolution of the surgical incision has been closely correlated to the major developments in the field of surgery, medicine, and technology. In the early days, before the development of general anesthesia and positive-pressure ventilation, the incisions were mostly small and were used predominantly to drain localized infectious complications, or else they were ingeniously designed to be used via an extrapleural approach (especially to lower thoracic structures). With the use of general anesthesia, incisions became bolder and larger, and the posterolateral thoracotomy was the most widely used approach. The ability to isolate the ipsilateral lung for surgery and the introduction of new stapling devices allowed the use of smaller, more focused incisions with muscle-sparing techniques and minimal rib-spreading. With the continued evolution of cardiac surgery, the median sternotomy and its many variations are currently among the most widely used incisions for cardiac procedures; they are occasionally used for thoracic procedures as well. The appropriate thoracic incision is the one that will provide the best exposure to the region of the thorax being addressed in a given procedure. For making that judgment, a thorough understanding of the anatomy of the thorax is an absolute prerequisite. For example, in most major lung resections, it is the hilum of the lung that should be well exposed. Emphasis is often placed on the muscle groups that are be divided during the procedure. 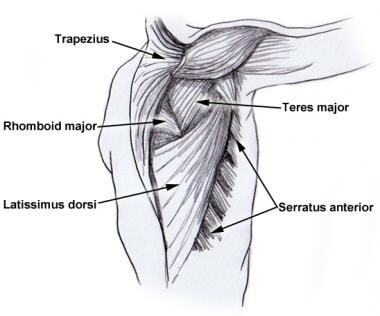 The latissimus dorsi and the serratus anterior are the main muscles of the lateral chest wall. The pectoralis and the rectus abdominis require attention during anterior incisions. The most important muscles of the posterior chest wall include the trapezius, the rhomboids, and the paraspinous muscles (see the image below). Special incisions that include partial sternotomies and first-rib resections require a thorough knowledge of the anatomy of the base of the thoracic cage. Muscles of the chest wall (muscles that are commonly encountered during the performance of thoracotomies). Ismail NA, Elsaegh M, Dunning J. Novel Techniques in Video-assisted Thoracic Surgery (VATS) Lobectomy. Surg Technol Int. 2015 May. 26:206-9. [Medline]. Chin CS, Shahani R. Anatomy of the thorax. Sellke FW, del Nido PJ, Swanson SJ, eds. Sabiston and Spencer Surgery of the Chest. 9th ed. Philadelphia: Elsevier; 2016. Vol 1: Chap 1. Robicsek F, Daugherty HK, Cook JW. The prevention and treatment of sternum separation following open-heart surgery. J Thorac Cardiovasc Surg. 1977 Feb. 73 (2):267-8. [Medline]. Kutsal A, Ibrişim E, Catav Z, Taşdemir O, Bayazit K. Mediastinitis after open heart surgery. Analysis of risk factors and management. J Cardiovasc Surg (Torino). 1991 Jan-Feb. 32 (1):38-41. [Medline]. Reser D, Holubec T, Yilmaz M, Guidotti A, Maisano F. Right lateral mini-thoracotomy for mitral valve surgery. Multimed Man Cardiothorac Surg. 2015. 2015:[Medline]. El-Hag-Aly MA, Nashy MR. Double edge closure: a novel technique for reducing post-thoracotomy pain. A randomized control study. Interact Cardiovasc Thorac Surg. 2015 Nov. 21 (5):630-5. [Medline]. Pipanmekaporn T, Punjasawadwong Y, Charuluxananan S, Lapisatepun W, Bunburaphong P, Boonsri S, et al. The Effectiveness of Intravenous Parecoxib on the Incidence of Ipsilateral Shoulder Pain After Thoracotomy: A Randomized, Double-Blind, Placebo-Controlled Trial. J Cardiothorac Vasc Anesth. 2018 Feb. 32 (1):302-308. [Medline]. Elfokery BM, Tawfic SA, Abdelrahman AM, Abbas DN, Abdelghaffar IM. Comparative study on the analgesic effect of acute ipsilateral shoulder pain after open thoracotomy between preoperative ultrasound guided suprascapular nerve block (SNB) and intraoperative phrenic nerve infiltration (PNI) in cancer lung patients. J Egypt Natl Canc Inst. 2018 Mar. 30 (1):27-31. [Medline]. Baeza OR, Foster ED. Vertical axillary thoracotomy: a functional and cosmetically appealing incision. Ann Thorac Surg. 1976 Sep. 22 (3):287-8. [Medline]. Ginsberg RJ. Alternative (muscle-sparing) incisions in thoracic surgery. Ann Thorac Surg. 1993 Sep. 56 (3):752-4. [Medline]. McNeill TM, Chamberlain JM. Diagnostic anterior mediastinotomy. Ann Thorac Surg. 1966 Jul. 2 (4):532-9. [Medline]. Thirlby RC, Kraemer SJ, Hill LD. Transdiaphragmatic approach to the posterior mediastinum and thoracic esophagus. Arch Surg. 1993 Aug. 128 (8):897-901; discussion 901-2. [Medline]. Hasson HM. A modified instrument and method for laparoscopy. Am J Obstet Gynecol. 1971 Jul 15. 110 (6):886-7. [Medline]. Jacobeus HC. The practical importance of thoracoscopy in surgery of the chest. Surg Gynecol Obstet. 1922. 34:289. Abouarab AA, Rahouma M, Kamel M, Ghaly G, Mohamed A. Single Versus Multi-Incisional Video-Assisted Thoracic Surgery: A Systematic Review and Meta-analysis. J Laparoendosc Adv Surg Tech A. 2018 Feb. 28 (2):174-185. [Medline]. WATSON WL, JAMES AG. Fascia lata grafts for chest wall defects. J Thorac Surg. 1947 Aug. 16 (4):399-406. [Medline]. Pancoast HK. Superior pulmonary sulcus tumor. JAMA. 1932. 99:16-17. Rusch VW, Giroux DJ, Kraut MJ, Crowley J, Hazuka M, Winton T, et al. Induction chemoradiation and surgical resection for superior sulcus non-small-cell lung carcinomas: long-term results of Southwest Oncology Group Trial 9416 (Intergroup Trial 0160). J Clin Oncol. 2007 Jan 20. 25 (3):313-8. [Medline]. Dartevelle PG, Chapelier AR, Macchiarini P, Lenot B, Cerrina J, Ladurie FL, et al. Anterior transcervical-thoracic approach for radical resection of lung tumors invading the thoracic inlet. J Thorac Cardiovasc Surg. 1993 Jun. 105 (6):1025-34. [Medline]. Masaoka A, Ito Y, Yasumitsu T. Anterior approach for tumor of the superior sulcus. J Thorac Cardiovasc Surg. 1979 Sep. 78 (3):413-5. [Medline]. Partial sternotomy. Combined with a transverse collar neck incision, an upper partial sternotomy gives excellent access to the trachea, thymus, thyroid, etc. The latissimus dorsi muscle. The latissimus dorsi muscle defines the nomenclature for standard thoracotomy incisions, with incisions through it arbitrarily defined as lateral. Basic thoracic incisions. Standard thoracotomy incision shown, which can be modified and minimized. Video-assisted thoracic surgery (VATS) incisions can also be incorporated into the standard incision. Clamshell incision (bilateral thoracosternotomy). The skin incision is in the inframammary crease, curving upwards toward the midline. Videothoracoscopic approach (VATS). Typical positioning of VATS instruments with the camera in the center position of the triangle. Anterior approach to Pancoast tumor. Neck incision along the sternocleidomastoid muscle, across the manubrium and then laterally below the clavicle. A special thank you to Patricia Smith for typing my hand written chapter. Should Minimally Invasive Esophagectomy Now Be Standard?